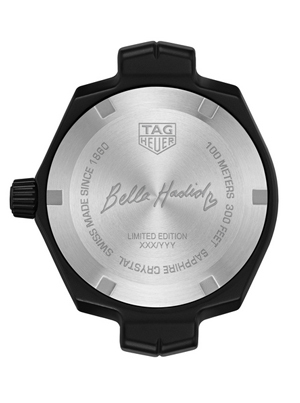 TAG Heuer has unveiled its special edition watch designed for model and Tag Heuer brand ambassador, Bella Hadid. 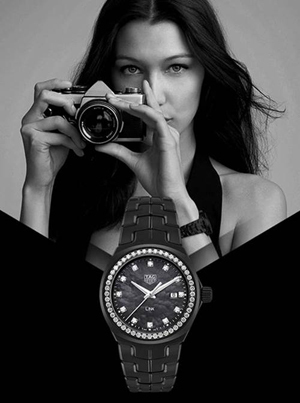 To emphasise the glamorous, vivacious side of Bella Hadid, a Link watch — the most feminine model in the entire collection — was chosen. All matt black, with a magnificent mother-of-pearl dial proudly showcasing 12 diamonds, the watch is modern and contemporary, made entirely from ceramic, the perfect watchmaking material. The bracelet is the famous Link design, which is one of the most comfortable bracelets to wear. Each component of the bracelet is polished, ensuring it is smooth to the touch and flexible on the wrist. Thanks to this sublime attention to detail, wearing the Link becomes a veritable experience, one filled with elegance and charm. The piece is further embellished by a bezel set with 48 diamonds, while the back of the watch is engraved with the star’s signature. The result is elegant, glamorous, and full of character. Just like Bella herself. Limited to 500 pieces, this special edition is sure to delight any woman!